Monitoring of the tissue graft during and after the grafting operation is useful in reducing the risk for tissue ischemia, which may lead to even graft loss. Possible complications should be detected as early as possible in order to minimize the re-operation. Three models representing muscle tissue were created in FEMLAB: an isotropic model and two anisotropic models, the latter ones having the electrodes either perpendicular or parallel to the muscle fibres. Eleven tetrapolar measurement configurations having varying inter-electrode distances were modelled in each model to study their measurement sensitivity distributions. The results showed effects of anisotropy on both the measured impedance and the associated sensitivity distributions. For example, regions of negative sensitivity or depth for maximum sensitivity were dependant on whether the electrodes were placed perpendicular or parallel to the muscle fibres. The results point out also how to estimate the tissue anisotropy and how to measure impedance changes deeper in the tissue volume. 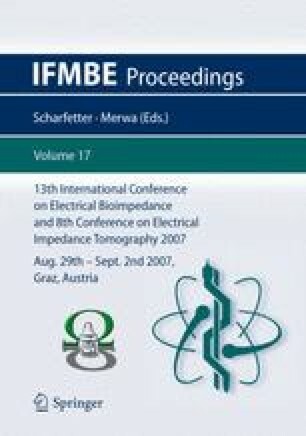 The impedance method seems to be suitable for monitoring the muscle graft healing. However, more work is needed for reliable interpretations between the measured impedance and physiological changes.